Chef Mike and his crew are competing in a "Top Chef" style event at A Taste of Senior Living in Clarkesville on October 4th. He'll be serving his 72 Hour Sous Vide Beef Short Ribs with Kohlrabi Pesto Salad. We've had both and they're amazing! Wash and peel two medium kohlrabis. Using a spiralizer or vegetable peeler, make kohlrabi into noodles. Mix 1 tsp of lime juice with 1/3 cup of olive oil and 1 cup of chopped sundried tomatoes. In a large bowl, combine the lime juice combination with your kohlrabi noodles, mix gently and allow to tenderize. Blend 1 cup of fresh lemon balm (herb), 2 cloves of young garlic, 1/2 cup of pine nuts, 1/4 cup of olive oil, the juice from 1 lime and a quarter tsp of sea salt in a blender or food processor. 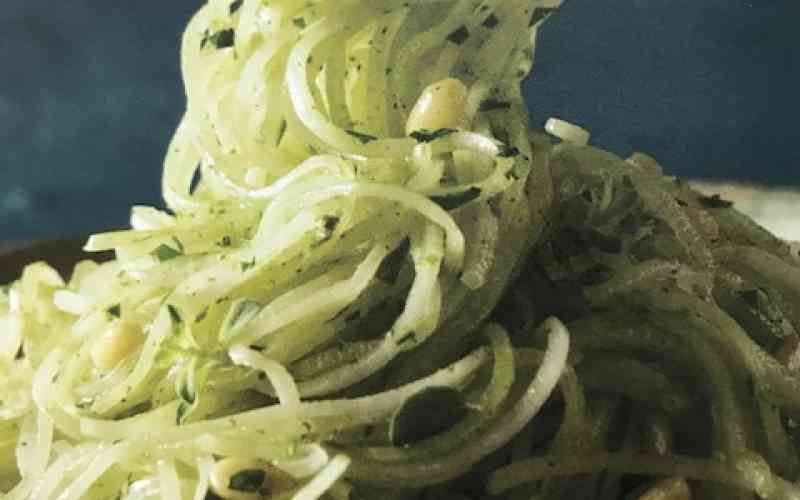 Add Pesto Sauce to Raw Kohlrabi and mix well.